The BMW 4 Series Convertible offers an efficiently desirable package in 420d guise. Jonathan Crouch reports. 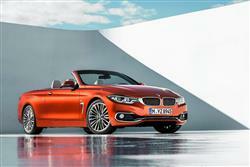 The best-selling 4 BMW 4 Series Convertible model will be a diesel: this one in fact - the 420d. The engine under the bonnet may only have four cylinders but it develops a healthy 190bhp - and much more pulling power than the equivalent petrol version. It's even refined enough for owners to properly enjoy the roof-down vibes. If you want a BMW 4 Series Convertible, it's likely to be because you like the idea of the kind of metal folding roof that rivals in this segment can't offer. This car has a smarter look in this improved form and most buyers like the 420d diesel version. Let's find out why. The chassis of the 4 Series Convertible is based on that of the coupe but the springs, damping and axle characteristics have all been tailored for the open car. By modifying and fine-tuning variables such as the camber angle, the track and the roll centre, BMW has optimised agility and steering accuracy. Dynamic changes made to this improved model mean stiffer suspension and an upgraded steering set-up. These measures have resulted in a tangible improvement in both lateral and longitudinal handling properties, regardless of the load on board. The upshot is reduced roll, more neutral responses when driving at the limit, even greater straight-line stability and the wonderfully precise steering for which BMW is renowned. This applies to the standard suspension, as well as the M Sport suspension and Adaptive suspension. As before, Servotronic power steering is standard, with Variable Sports Steering offered as an option. A six-speed manual gearbox is fitted as standard with an eight-speed automatic available if you pay a little extra. With over 60% of buyers likely to favour a black pump BMW, we chose the 420d variant to try, a car with nearly the same output (190bhp) as its petrol-fuelled 420i counterpart but offering nearly 30% more torque, 380Nm making itself keenly felt from low revs. The most obvious stats don't immediately bear this out - both cars make 62mph from rest in just over 8s (only fractionally slower than their Coupe counterparts) on the way to a top speed of just under 150mph - but you really feel the diesel's extra torque out on the road. You'll need a budget of around £40,000 for the 420d diesel, so you'll need to allow for a premium of around £2,500 over the equivalent 420i petrol version - with a further £1,500 needed if you want the 8-speed automatic paddleshift gearbox rather than the standard 6-speed manual. Equipment runs to leather heated seats, xenon headlamps, LED rear lights, a parking radar, as well as climate control. Satellite navigation is standard on most versions, but the adaptive dampers are a box you might want to tick on the options list as well as the sport steering. And options? Well, we could take or leave the sports seats, but the stereo upgrade is worth giving a listening to. BMW will also tempt you with a range of connected services, a head-up display, and some neat driver aids but you'll need to keep an eye on the asking price. Buyers also get the option of a wider wind deflector, while there's also the three-temperature Air Collar, which is a blatant crib of Mercedes' Air Scarf system but a welcome addition nevertheless. The optional wind deflector is now smaller, lighter, more effective and easier to use. When it is not needed, it can be stored behind the rear seats to save space. Can this really be seen as an efficient car? After all, it carries around a very inefficiently heavy roof mechanism. A BMW 320d saloon weighs 1,495kg: this 420d Convertible weighs 1,755kgs. Those are the facts - and they go much of the way towards explaining why metal folding roofs have fallen from favour the in current, efficiency-obsessed automotive design. Having said all of that, the Munich maker is keen to point out just how much effort has gone into minimising the downsides of this approach with this car. A whole range of weight-saving measures, including use of aluminium in areas like the suspension, has meant that most 4 Series Convertible variants are up to 20kgs lighter than their predecessors. All of which explains why this 4 Series manages to be so class-competitive when it comes to running costs. The manual gearbox 420d Convertible we tried manages 55.4mpg on the combined cycle and 134g/km of CO2 in manual form, improvingh to 60.1mpg and 124g/km if you go for the automatic version. The BMW 4 Series seems to be a carefully managed piece of product development, especially in 420d guise. You have to like the idea of a metal folding roof in order to want one but if you do, you'll find plenty to like here. Make no mistake, this is no half measure design. BMW can congratulate themselves on a job well done.